You can add the HKC GSM-WIFI card to your alarm system in order to communicate with the system using your phone. When the alarm system is triggered the dialler uses the Securecomm service to send a text, voice message, or push notification to whichever phones you like. This device can also be used to connect to central station monitoring if required. The device can avail of 2 paths to send signals by using its embedded sim card or the wifi in your home. It will choose the best signal and if that fails it will switch to the other path. The GSM/GPRS unit is supplied with a pre-fitted World SIM that will only work with that device. 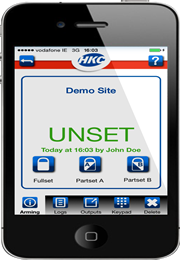 The unit communicates with SecureComm - HKC's cloud based solution via the HKC APP and SmartLink700 software. SecureComm provides a heartbeat (polled) connection to the GSM-SC which will signal a loss of communication in the event of an interruption in the GPRS signal. All alarms and alerts are notified to the user via the Smartphone APP (audible and text). The GSM-WIFI can also send and recieve text messages either to communicate alarm events or to allow the user to arm/disarm the system from a mobile phone. Alarm zone 3 patio door. The device has jam detection which triggers the alarm system in the event of gsm jamming devices being deployed by the burglars. The HKC GSM-WIFI costs 150 euro supply and fit to any new HKC system installed by us. The Securecom service has a yearly subscription fee of 60 euro which includes all charges for text and data. The Hkc app costs 8 euro to download per phone. If the alarm is triggered the gsm-wifi via the securecomm service will notify your smartphone via the app and give specific details. If the alarm is triggered the gsm-wifi will send a text to your phone giving specific details. If the alarm loses contact with the securecomm service you will recieve notification to your smartphone via the app. You can arm/disarm the alarm using the app or text message commands. You can view/use the alarm keypad on your smartphone screen using the app.